If you have ever picked up a vintage cookbook there will undoubtedly be a recipe for deviled eggs. 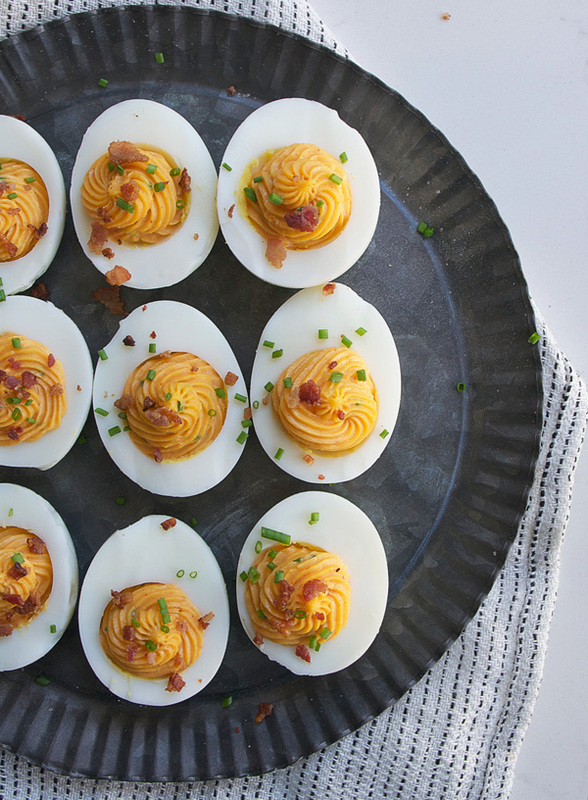 Deviled eggs have been around for years, even decades, and I don’t see them going anywhere. They are a classic appetizer that is perfect for entertaining or just plan snacking. Although the classic recipe is delicious, I have updated my deviled eggs by adding some sriracha, curry powder and bacon. 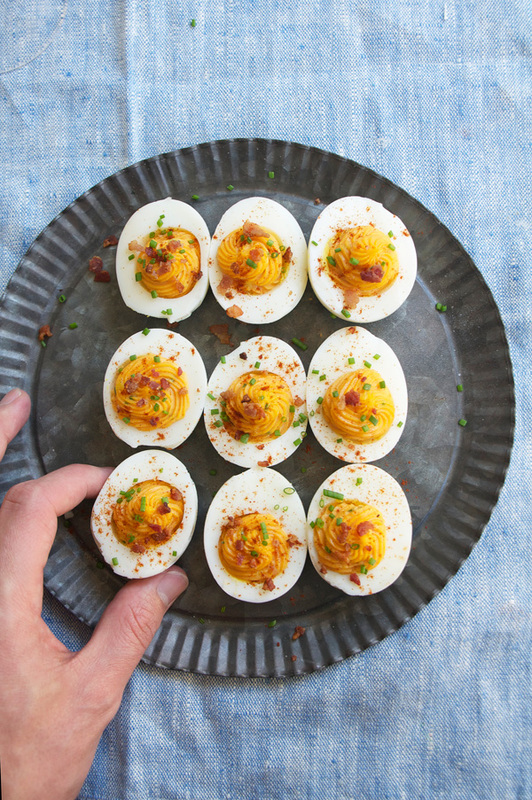 All three flavors come together to create a smooth, spicy and hearty deviled egg. 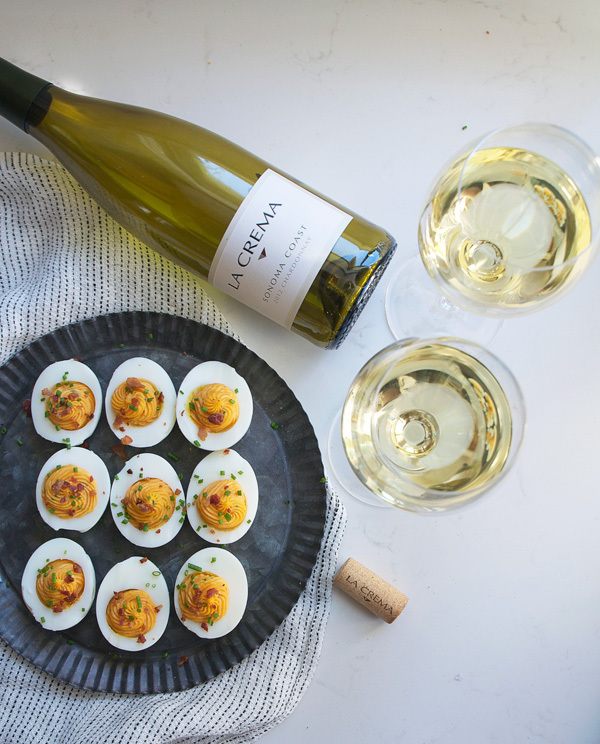 The richness of the deviled eggs is a perfect match with a lush, Chardonnay. La Crema Sonoma Coast Chardonnay fits the bill nicely! If you are unfamiliar with sriracha, it is a Thai chili paste that adds a touch of heat and lots of flavor to whatever you are cooking. 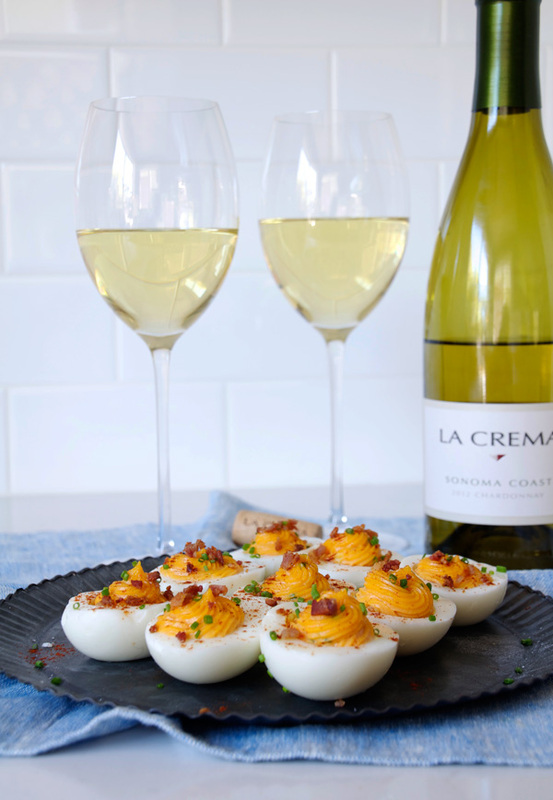 Paired with a sweet curry powder and salty bacon, this is one amazing deviled egg. So with Easter coming up and spring and summer outdoor parties in sight, whip up a batch of these delicious deviled eggs and remember why deviled eggs will always be the perfect appetizer. Tip: There are a couple ways to get those pesky shells off the hard-boiled eggs—farm-fresh eggs are harder to peel. I use supermarket eggs because they are slightly older and have a larger air pocket, making peeling easier. I also crack the eggs gently after they have been boiled and let them sit in cold water overnight. In a large pot or sauté pan, cover the eggs with cold water and bring to a boil. Remove the pot from the heat, cover, and let sit for exactly 14 minutes. Plunge the eggs into a bowl of ice water to cool Gently tap the eggs with the back of a spoon and let the eggs sit in water for a couple hours or overnight to help loosen the shell. When ready to serve remove the shell. Using a slightly moistened thin, sharp knife, cut the eggs in half lengthwise. Remove the egg yolks into a medium bowl and mash with a fork. Stir in the mayonnaise, Sriracha, curry powder and 3 tablespoons of the chives, mixing until very smooth. Transfer the yolk mixture to a pastry bag fitted with a star or plain tip, or a zip-top bag (with the corner cut off). Set the egg whites on a serving platter and pipe in the filling. 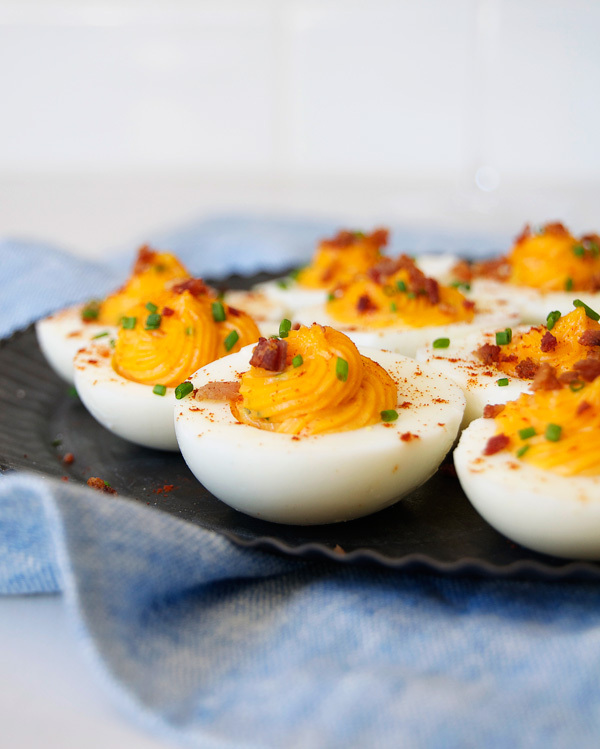 Just before serving, sprinkle the deviled eggs with bacon crumbles and remaining chives.